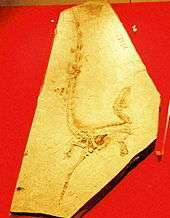 Sinosauropteryx (meaning "Chinese reptilian wing", Chinese: 中华龙鸟; pinyin: Zhōnghuá lóng niǎo; literally: "China dragon bird") is a compsognathid dinosaur. Described in 1996, it was the first dinosaur taxon outside of Avialae (birds and their immediate relatives) to be found with evidence of feathers. It was covered with a coat of very simple filament-like feathers. Structures that indicate colouration have also been preserved in some of its feathers, which makes Sinosauropteryx the first non-avialian dinosaurs where colouration has been determined. The colouration includes a reddish and light banded tail. Some contention has arisen with an alternative interpretation of the filamentous impression as remains of collagen fibres, but this has not been widely accepted. Sinosauropteryx was a small theropod with an unusually long tail and short arms. 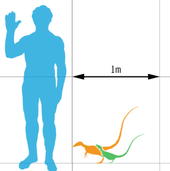 The longest known specimen reaches up to 1.07 metres (3.5 feet) in length, with an estimated weight of 0.55 kilograms (1.2 pounds) It was a close relative of the similar but older genus Compsognathus, both genera belonging to the family Compsognathidae. 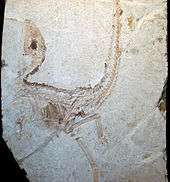 Only one species of Sinosauropteryx has been named: S. prima, meaning "first" in reference to its status as the first feathered non-avialian dinosaur species discovered. Three specimens have been described. The third specimen previously assigned to this genus represents either a second, as-yet unnamed species or a distinct, related genus. While Sinosauropteryx had feather-like structures, it was not very closely related to the previous "first bird" Archaeopteryx. There are many dinosaur clades that were more closely related to Archaeopteryx than Sinosauropteryx was, including the deinonychosaurians, the oviraptorosaurians, and the therizinosauroids. This indicates that feathers may have been a characteristic of many theropod dinosaurs, not just the obviously bird-like ones, making it possible that equally distant animals such as Compsognathus had feathers as well. Reconstruction illustrating colouration as suggested by the study of preserved melanosomes. Black regions and most of the sides lack fossilised feathers. Longrich's conclusions were supported in a paper first published online in the journal Nature in January 2010. Fucheng Zhang and colleagues examined the fossilized feathers of several dinosaurs and early birds, and found evidence that they preserved melanosomes, the cells that give the feathers of modern birds their colour. 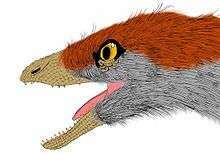 Among the specimens studied was a previously undescribed specimen of Sinosauropteryx, IVPP V14202. By examining melanosome structure and distribution, Zhang and colleagues were able to confirm the presence of light and dark bands of colour in the tail feathers of Sinosauropteryx. Furthermore, the team was able to compare melanosome types to those of modern birds to determine a general range of colour. From the presence of phaeomelanosomes, spherical melanosomes that make and store red pigment, they concluded that the darker feathers of Sinosauropteryx were chestnut or reddish brown in colour. Despite its feathers, most palaeontologists do not consider Sinosauropteryx to be birds. Phylogenetically, the genus is only distantly related to the clade Aves, usually defined as Archaeopteryx lithographica plus modern birds. 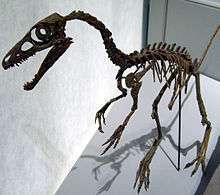 The scientists who described Sinosauropteryx, however, used a character-based, or apomorphic, definition of the Class Aves, in which any animal with feathers is considered to be a bird. They argued that the filamentous plumes of Sinosauropteryx represent true feathers with a rachis and barbs, and thus that Sinosauropteryx should be considered a true bird. They classified the genus as belonging to a new biological order, Sinosauropterygiformes, family Sinosauropterygidae, within the subclass Sauriurae. These proposals have not been accepted, and Sinosauropteryx is generally classified in the family Compsognathidae, a group of small-bodied long-tailed coelurosaurian theropods known from the Late Jurassic and Early Cretaceous of Asia, Europe, and South America. Three specimens have been assigned to Sinosauropteryx prima: the holotype GMV 2123 (and its counter slab [opposite face], NIGP 127586), NIGP 127587, and D 2141. Another specimen, IVPP V14202, was assigned to the genus but not to the only species by Zhang and colleagues. The assignment of an additional larger specimen to S. prima, GMV 2124, was later found to be in error. All of the fossils were found in the Jianshangou or Dawangzhangzi Beds of the Yixian Formation in the Beipiao and Lingyuan regions of Liaoning, China. These fossil beds have been dated to 124.6–122 million years ago, during the late Barremian to early Aptian stages of the Early Cretaceous. 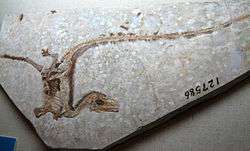 The specimen NIGP 127587 was preserved with the remains of a lizard in its gut region, indicating that small, fast-moving animals made up part of the diet of Sinosauropteryx prima. Numerous lizards of this type have been found in the same rocks as Sinosauropteryx, but have yet to be described. The same specimen of S. prima which had preserved a lizard in its stomach contents (NIGP 127587) also had several small eggs in its abdomen. Two eggs were preserved just in front of and above the pubic boot, and several more may lie underneath them on the slab. It is unlikely that they were eaten by the animal, as they are in the wrong part of the body cavity for the egg shells to have remained intact. It is more likely that they are unlaid eggs produced by the animal itself. Each egg measured 36 mm (1.4 in) long by 26 mm (1.0 in) wide. The presence of two developed eggs suggests that Sinosauropteryx had dual oviducts and laid eggs in pairs, like other theropods. Sinosauropteryx, as a Yixian Formation dinosaur, is a member of the Jehol Biota, the assemblage of organisms found in the Yixian Formation and overlying Jiufotang Formation. The Yixian Formation is composed largely of volcanic rocks such as andesite and basalt. Between the volcanic layers are several beds of sedimentary rocks representing deposition in a lake. The freshwater lake strata of the Yixian Formation have preserved a wide variety of plants, invertebrates, and vertebrates. Gymnosperm forests were extensive, with a few early flowering plants as well. Ostracods and insects were diverse, and bivalves and gastropods were abundant. Mammals and birds are also well-known from the formation. The setting was subject to periodic mortality events including volcanic eruptions, wildfires, and noxious gases erupting from the lakes. The climate has been interpreted as temperate, with distinct wet and dry seasons. The yearly temperature during this time period averaged about 10 degrees celsius (50 degrees Fahrenheit), indicating a temperate climate with unusually cold winters for the generally warm Mesozoic era, possibly due to northern China's high latitude during this time. 1 2 3 4 5 6 7 8 9 10 11 12 13 14 15 16 17 Chen, P.; Dong, Z.; Zhen, S. (1998). "An exceptionally well-preserved theropod dinosaur from the Yixian Formation of China". Nature. 391 (8): 147–152. doi:10.1038/34356. 1 2 3 4 5 6 7 Currie, P.J. ; Chen, P.-j. (2001). "Anatomy of Sinosauropteryx prima from Liaoning, northeastern China". Canadian Journal of Earth Sciences. 38 (1): 705–727. doi:10.1139/cjes-38-12-1705. ↑ Therrien, F.; Henderson, D.M. (2007). "My theropod is bigger than yours...or not: estimating body size from skull length in theropods". Journal of Vertebrate Paleontology. 27 (1): 108–115. doi:10.1671/0272-4634(2007)27[108:MTIBTY]2.0.CO;2. ↑ Ruben, J.A. ; Jones, T.D. ; Geist, N.R. ; Hillenius, W.J. (1997). "Lung structure and ventilation in theropod dinosaurs and early birds". Science. 278 (5341): 1267–1270. doi:10.1126/science.278.5341.1267. 1 2 Padian, K. (2004). "Basal Avialae". In Weishampel, David B.; Dodson, Peter; Osmólska, Halszka. The Dinosauria (Second ed.). Berkeley: University of California Press. pp. 210–231. ISBN 0-520-24209-2. 1 2 Longrich, N. (2002). "Systematics of Sinosauropteryx". Journal of Vertebrate Paleontology. 22 (supplement to 3): 80A. 1 2 3 Zhang, F.; Kearns, S.L. ; Orr, P.J. ; Benton, M.J.; Zhou, Z.; Johnson, D.; Xu, X.; Wang, X. (2010). "Fossilized melanosomes and the colour of Cretaceous dinosaurs and birds". Nature. 463 (7284): 1075–1078. doi:10.1038/nature08740. PMID 20107440. 1 2 Ji, Q.; Ji, S. (1997). "Advances in Sinosauropteryx research". Chinese Geology. 7: 30–32. 1 2 3 Ji, Q.; Ji, S. (1996). "On discovery of the earliest bird fossil in China (Sinosauropteryx gen. nov.) and the origin of birds" (PDF). Chinese Geology. Beijing: Chinese Geological Museum. 10 (233): 30–33. 1 2 3 4 Ji, S.; Gao, C.; Liu, J.; Meng, Q.; Ji, Q. (2007). "New material of Sinosauropteryx (Theropoda: Compsognathidae) from western Liaoning, China". Acta Geologica Sinica (English Edition). 81 (2): 177–182. doi:10.1111/j.1755-6724.2007.tb00942.x. ↑ Paul, G. S. (2010). The Princeton Field Guide to Dinosaurs. Princeton, NJ: Princeton University Press. p. 117. ISBN 978-0-691-13720-9. ↑ Senter, P.; Kirkland, J. I.; Deblieux, D. D.; Madsen, S.; Toth, N. (2012). Dodson, Peter, ed. "New Dromaeosaurids (Dinosauria: Theropoda) from the Lower Cretaceous of Utah, and the Evolution of the Dromaeosaurid Tail". PLoS ONE. 7 (5): e36790. doi:10.1371/journal.pone.0036790. PMC 3352940 . PMID 22615813. 1 2 Gishlick, A.D.; Gauthier, J.A. (2007). "On the manual morphology of Compsognathus longipes and its bearing on the diagnosis of Compsognathidae". Zoological Journal of the Linnean Society. 149 (4): 569–581. doi:10.1111/j.1096-3642.2007.00269.x. 1 2 Browne, M.W. (19 October 1996). "Feathery Fossil Hints Dinosaur-Bird Link". New York Times. p. Section 1 page 1 of the New York edition. ↑ Feduccia, A. (1999). The Origin and Evolution of Birds (Second ed.). Yale University Press. p. 375. ISBN 0-300-07861-7. 1 2 3 Zhou, Z. (2006). "Evolutionary radiation of the Jehol Biota: chronological and ecological perspectives". Geological Journal. 41 (3–4): 377–393. doi:10.1002/gj.1045. ↑ Stieg, B. (23 April 1997). "Debate rages over birds' relation to dinosaurs". Knight-Ridder Newspapers. ↑ Morell, V. (1997). "The origin of birds: the dinosaur debate". Audubon Magazine. 99 (2): 36–45. ↑ Martin, L.; Czerkas, S.A. (2000). "The fossil record of feather evolution in the Mesozoic". American Zoologist. 40 (4): 687–694. doi:10.1668/0003-1569(2000)040[0687:TFROFE]2.0.CO;2. ↑ Geist, N.R. ; Jones, T.D. ; Ruben, J.A. (1997). "Implications of soft-tissue preservation in the compsognathid dinosaur, Sinosauropteryx". Journal of Vertebrate Paleontology. 7 (supplement to 3): 48A. doi:10.1080/02724634.1987.10011680. ↑ Feduccia, A. (1999). The Origin and Evolution of Birds (2nd ed.). New Haven, Connecticut: Yale University Press. p. 377. ISBN 0-300-07861-7. ↑ Ruben, J., J. A.; Jones, T.D. (2000). "Selective factors associated with the origin of fur and feathers". American Zoologist. 40 (4): 585–596. doi:10.1093/icb/40.4.585. ↑ Lingham-Soliar, T.; Feduccia, A.; Wang, X. (2007). "A new Chinese specimen indicates that 'protofeathers' in the Early Cretaceous theropod dinosaur Sinosauropteryx are degraded collagen fibres". Proceedings of the Royal Society B. 274 (1620): 1823–1829. doi:10.1098/rspb.2007.0352. PMC 2270928 . PMID 17521978. ↑ Sanderson, K. (23 May 2007). "Bald dino casts doubt on feather theory". doi:10.1038/news070521-6. Retrieved 14 January 2011. ↑ Sloan, C. (27 January 2010). "Dinosaur true colors revealed for first time". National Geographic Magazine. Retrieved 14 January 2011. ↑ Paul, G.S. (2002). Dinosaurs of the air: the evolution and loss of flight in dinosaurs and birds. Baltimore, Maryland: Johns Hopkins University Press. p. 66. ISBN 0-8018-6763-0. ↑ Hurum, J.H. ; Luo, Z.-X. ; Kielan-Jaworowska, Z. (2006). "Were mammals originally venomous?" (PDF). Acta Palaeontologica Polonica. 51 (1): 1–11. ↑ Wang, Y.; Zheng, S.; Yang, X.; Zhang, W.; and Ni, Q. (2006). "The biodiversity and palaeoclimate of conifer floras from the Early Cretaceous deposits in western Liaoning, northeast China." International Symposium on Cretaceous Major Geological Events and Earth System. p. 56A.